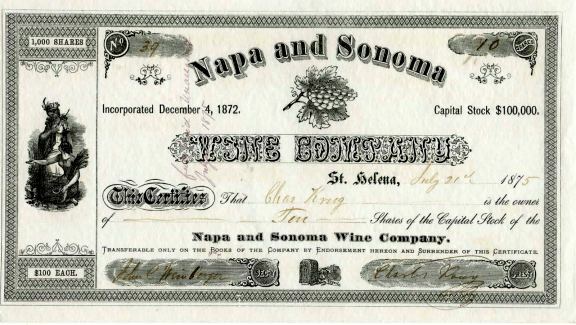 Beautiful RARE certificate #39 for 10 shares from the Napa and Sonoma Wine Company issued in 1875. This historic document has an ornate border around it with vignettes of grapes and two mythical women the left. This item has the signature of the Company’s President, Charles Krug and, Secretary, John C. Weinberger is over 143 years old. The certificate was issued to Charles Krug. Excellent condition. These are hard to find and highly desirable fully issued. In 1872, Charles Krug formed the Napa and Sonoma Wine Company with other producers to improve the quality of wine shipped to the East Coast. Charles Krug is now part of the Peter Mondavi Family Winery. Charles Krug (1825-1892) was among the pioneers of winemaking in the Napa Valley, California, and was the founder of the Charles Krug Winery. Charles Krug visited the United States from Prussia in 1847, and became a citizen in 1852. In 1851 he served as an apprentice winemaker for Agoston Haraszthy and then John Patchett before establishing his own winery. 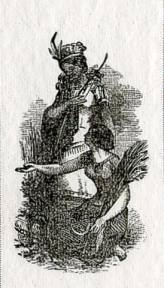 Krug married Carolina Bale, the daughter of early Napa Valley pioneer and miller Edward Turner Bale and granddaughter of María Isidora Vallejo of the prominent Californio Vallejo family, on December 26, 1860. Krug was inducted into the Culinary Institute of America's Vintner's Hall of Fame in 2007. Following Krug's death, James Moffitt Sr. purchased the winery in 1894. In 1943, Robert Mondavi persuaded his parents, Cesare and Rosa Mondavi, to purchase the inactive winery from Moffitt for $75,000. Robert Mondavi began his wine career there, until he founded his own winery in 1966. The winery still exists, and is owned by Robert's younger brother Peter Mondavi's family. In 1876 John C. Weinberger, an Ohio native, purchased a 240-acre estate in St. Helena, CA, where he settled with his family and founded the J.C. Weinberger Winery (Now William Cole Winery). He operated the business for only six years before a former employee murdered him. His widow Hannah continued the business, successfully operating the winery until the onset of Prohibition in 1920 forced its closure. The unoccupied estate gradually fell into disrepair until Maurice Harrison purchased it in 1938, five years after the end of Prohibition. A jealous employee, William Gau, desired Weinberger’s daughter, but when she spurned his romantic advances, Gau plotted to murder Weinberger, Bill Ballentine said. Gau laid a trap for Weinberger, getting him to come into the train station in St. Helena, where he fatally shot him on March 21, 1882.